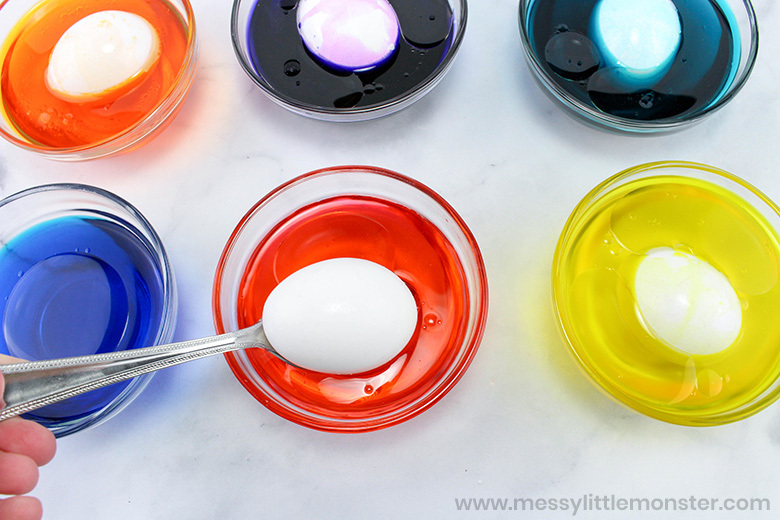 These dyed Easter eggs are so bright and colorful, and so PERFECT for anyone thinking about egg decorating! While the egg decorating kits are great, it is so much more fun to learn how to dye Easter eggs yourself. 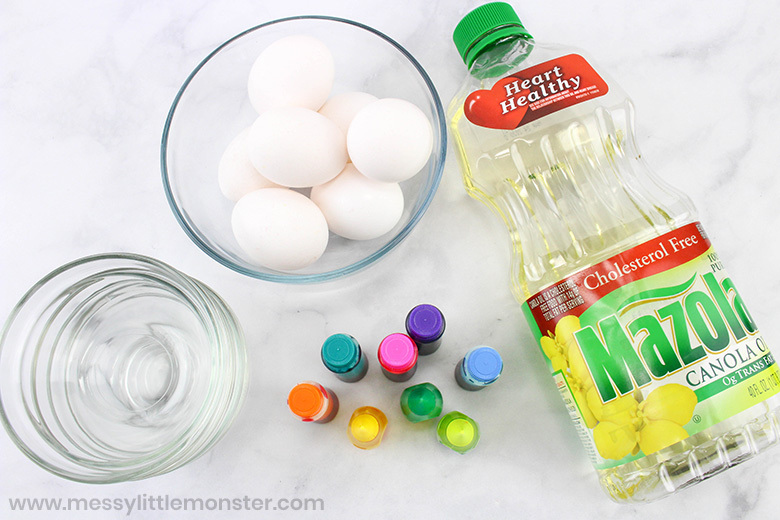 When coloring Easter eggs like these ones, you just use oil and water for the base. 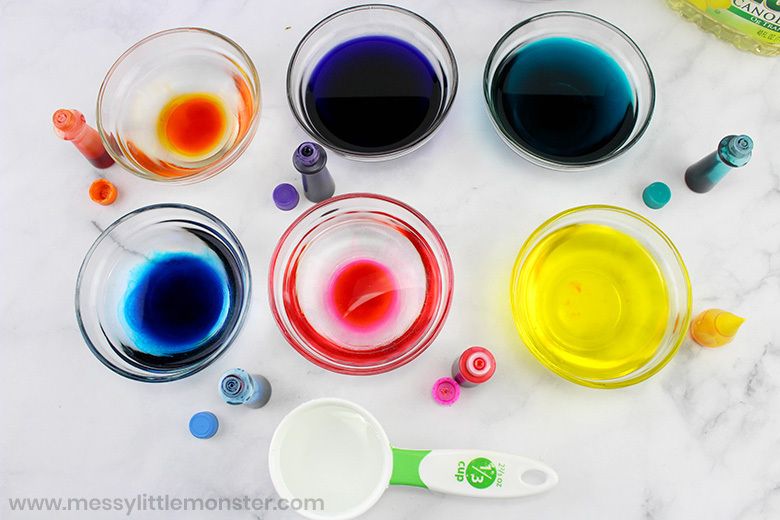 They're super easy, super fun, and kids as young as toddlers and preschoolers will LOVE helping to dye them. 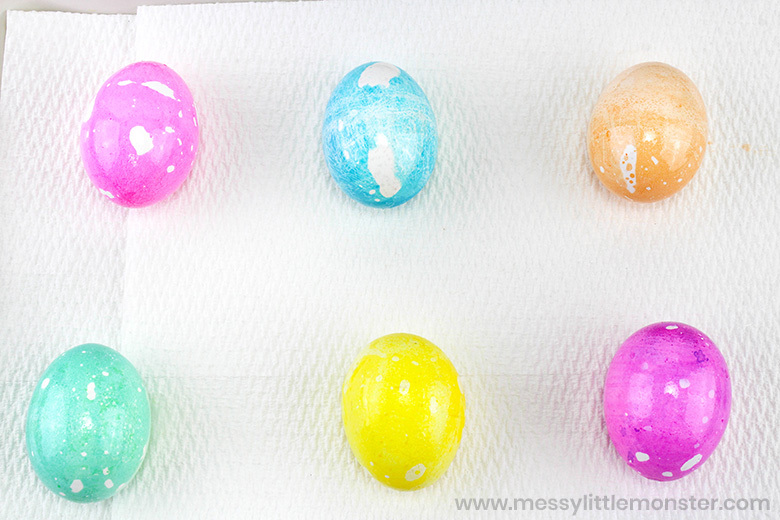 Just follow our easy step by step directions below to make your own dyed Easter eggs! Check out our top 10 tips for perfectly dyed Easter eggs. For more Easter egg crafts, be sure to check out these sponge painting easter eggs, this Easter egg craft made using q tips, this scrape painting Easter art, and these fun Easter coloring pages! Dyed Easter eggs are one of the best staples of Easter! Coloring Easter eggs has always been one of my favourite activities and it's even more fun now as an adult with kids of my own. 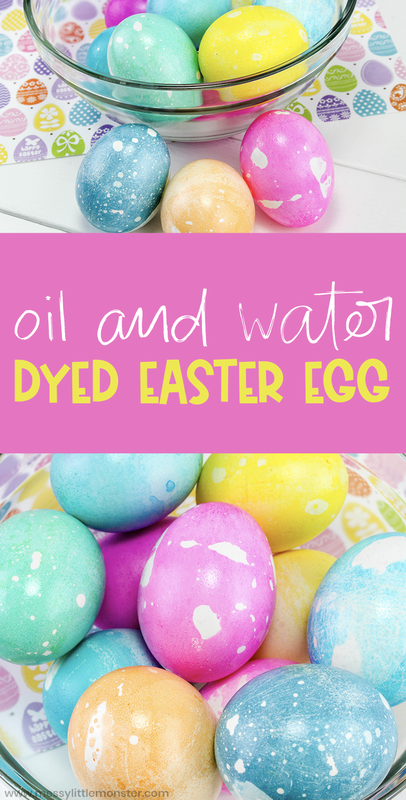 Just scroll down below to learn how to dye Easter eggs of your own! I know I always say this.... but it's so much easier when you gather up your ingredients and supplies first. I say it a lot because it's true, though! This especially comes true with an activity like this one as the kids will be so excited to get started. To get started, place 1/3 cup of water into a small bowl, making sure there's enough in your bowl to cover at least two-thirds of an egg when placed at the bottom. 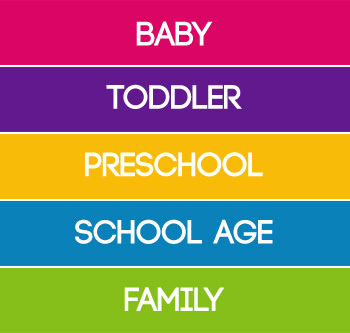 Repeat for each colour you'd like to use. Next, add 6-8 drops of food colouring into each bowl and mix. Then, add 1 tablespoon of oil into each bowl. Once you've done that, start placing an egg into each bowl. Use a spoon to spoon the mixture all over the egg and let it sit for 10 minutes. Then, roll it over onto the other side and let it sit for another 5-10 minutes. To finish up your Easter eggs, take them out of the bowls and lay on some paper towels to dry. Then, wipe off each egg with a separate paper towel. 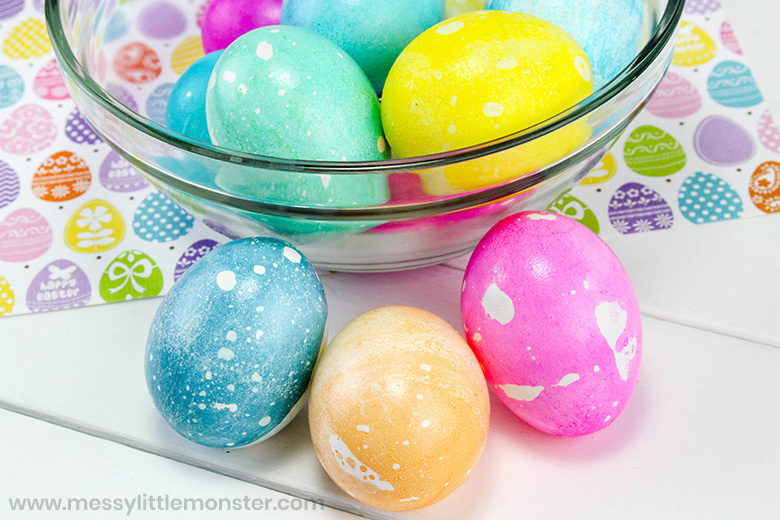 Don't you love how bright and colorful these dyed Easter eggs look! 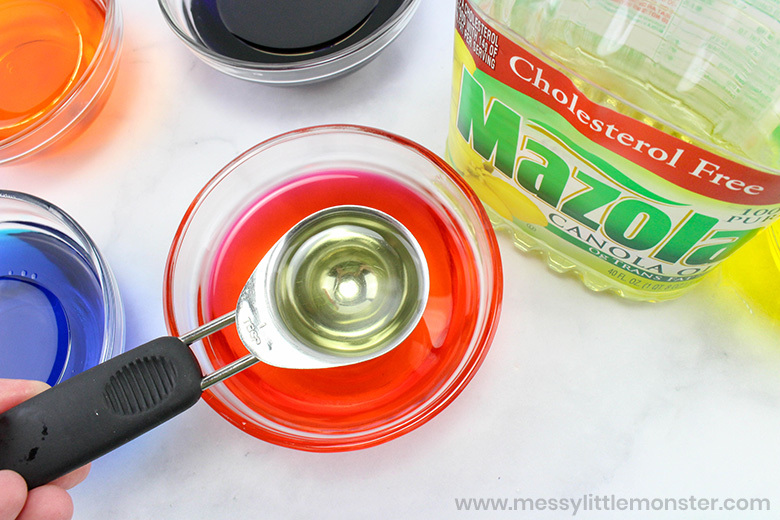 Coloring Easter eggs using oil and water is so effective, I LOVE the speckled look that is the result of the oil being added to the coloring. 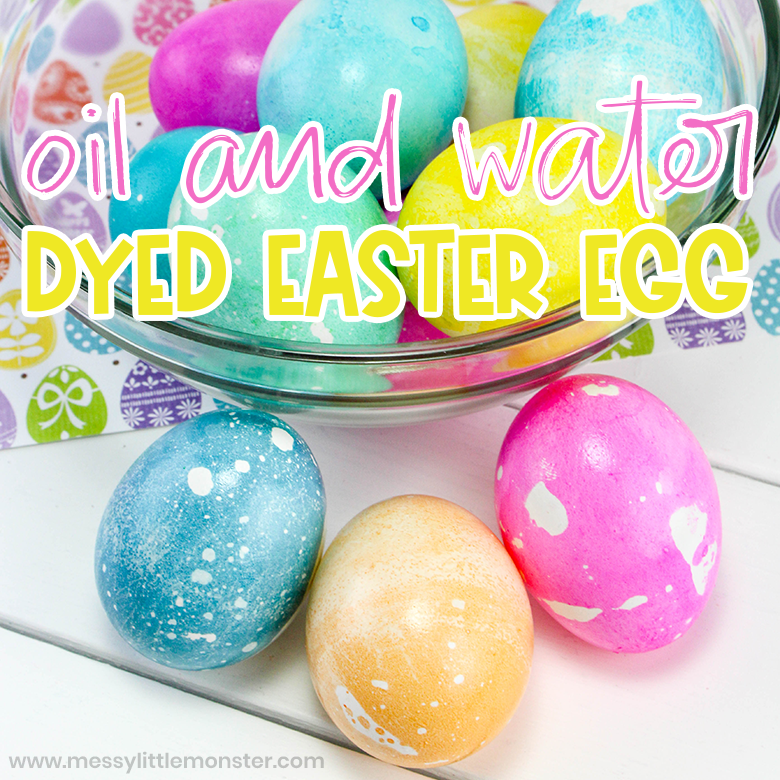 We hope you enjoyed learning how to dye Easter eggs using oil and water! 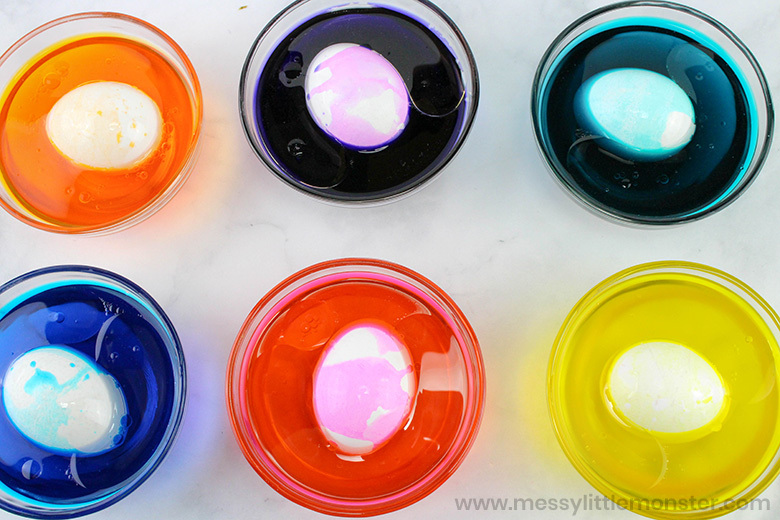 These dyed Easter eggs are so fun and easy to do with kids as young as toddler and preschoolers. Coloring Easter eggs is a great activity to do again and again before the Easter bunny makes his debut this year!